Happy Friday, y'all! This is Stephanie from The Learning Chambers and I'm here today to talk to you guys about small group instruction. 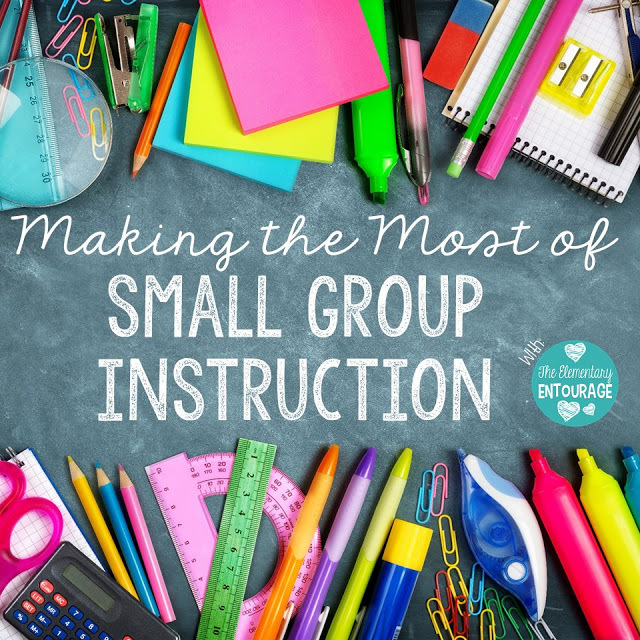 Let me start off by saying that I love love LOVE small group instruction! I try to teach in small groups as much as possible. 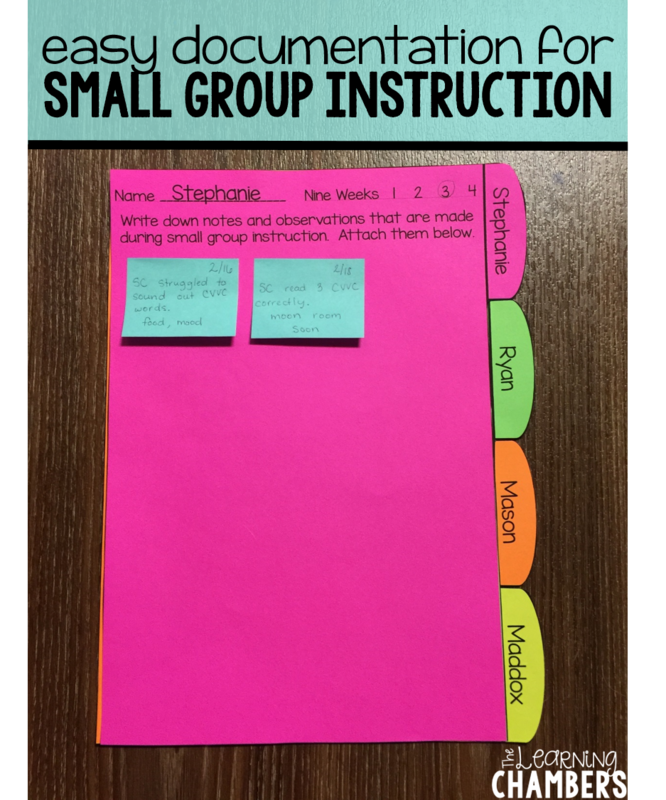 I'm a strong believer in individualized instruction and I believe that small group instruction is the way to achieve that. Today I wanted to share with you guys about how I keep track of and monitor my small groups. It's no secret that I love sticky notes! During small groups, I take short notes on my observations to help guide my instruction when we meet again. I normally write short notes and use student initials to help save time. 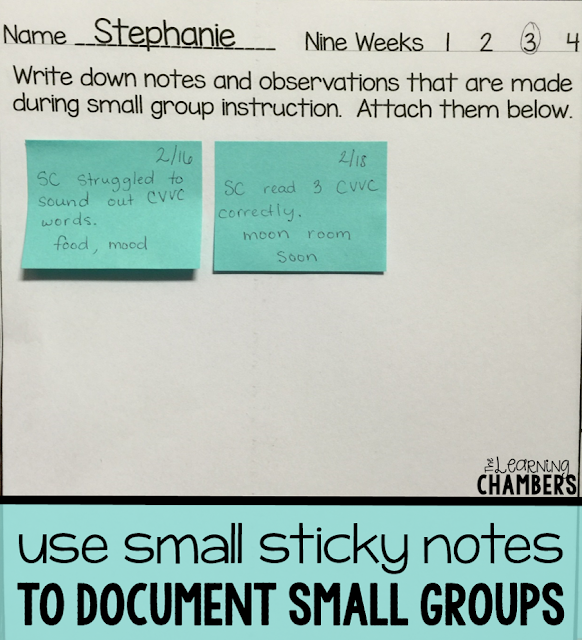 I stick the notes on my small group binder and then later I move them to the individual student pages. That saves me time because I don't have to keep flipping back and forth to each individual student page. Here is an example that I made to show you guys. My school has four nine-week semesters, so I print four copies for each student for the year. I circle the nine-week semester that we are currently in and use it until the end of the nine weeks. When the next nine weeks starts, I start on a new documentation form. I keep these document pages in my small group binder and they are perfect for documenting RTI. You could also staple the pages together and make a small group flipbook. I love using these because they are quick and easy and provide me with the information that I need to help support my students. Want to use these in your classroom to document your small group observations? I'm super excited to share this freebie with you guys! You can even type in your own students' names to save even more time! There are forms that include the nine weeks line and some blank ones as well. 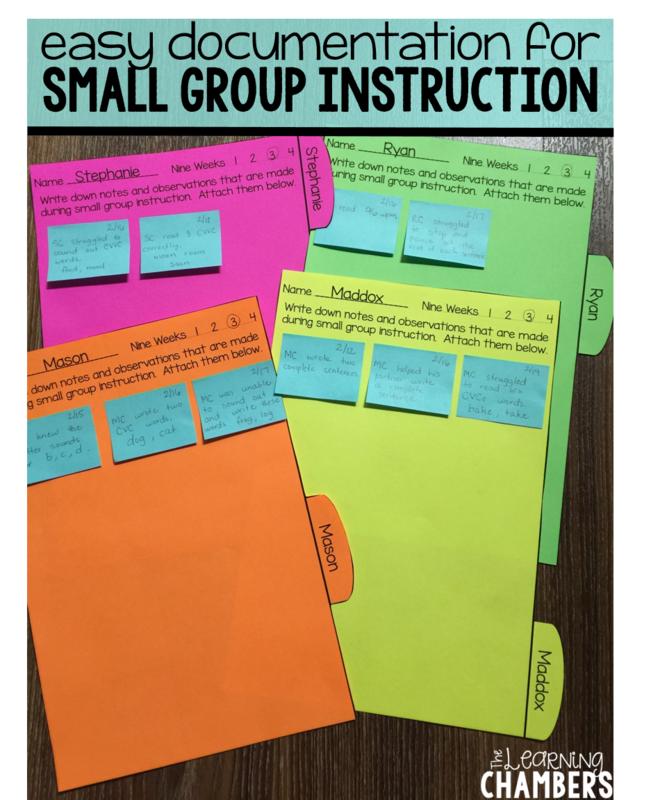 You can grab these small group student documentation forms HERE. Great post! Thank for sharing the document! Oh my goodness - this is so great! I have yet to find a consistent way to keep notes during small group and I think this will work! I love this. Have been trying many different ways to document. This might just work!! Would you mind sharing the font you use? Hi Barbara, it's KG Miss Kindergarten. I've also used shipping labels and it worked very well. My sticky notes tended to fall off after a while. These would be amazing if you laminated them and write the students' names with permanent markers [that can be wiped off each year]. I used this method with prek to document observations. I would fill the inside of a laminated file folder with sticky notes. Writing the names on each sticky note saved time and I could see at a glance which students I didn't have observations for during that week. I carried the folder with me everywhere so it was always handy. I could stick the notes into the child's folder at the end of the week or now a teacher could enter the notes digitally. Question: it says "nine weeks" but then has "weeks 1-4" written on the right corner. Please explain - I'm not sure what that means. Thank you! Hi Colleen. The school year is divided into 4 nine week periods. I circle the nine week period that we are in and I have four pages at the end of the year for each of my students. I hope that helps. Oh my word! Thank you so much for sharing! Anything that makes conferencing easy gets an A in my book! Sticky Notes is currently not available to you Sticky Notes is at display not open to you – What to do if Sticky Notes application would reestablish a slip-up like "Check your record, Sticky Notes is starting at now not available to you". The notice showing check your record suggested somethings else. Here you need to take after advances irregular with checking our record. Read Alouds We Love with KookyKinders! Read Alouds We Love with Mrs. Grooms' Room!